Lost or haven’t received your password? Marathon Asset Management is an independent, privately owned investment management firm based in London. Founded in 1986, Marathon has successfully applied longer-term and often contrarian strategies in its equity investments around the globe on behalf of its institutional client base. Over more than three decades, Marathon’s investment philosophy has evolved, but two simple ideas about how capitalism works in the long run have always been paramount. The first is the observation that high returns in industries tend to attract capital and competition, just as low returns repel them. The resulting ebb and flow of capital affects long-term returns for shareholders in often predictable ways, what we call the capital cycle. Since high levels of investment tend to be detrimental to shareholder returns over the long run, Marathon seeks to invest in companies with high returns sustained by barriers to entry deterring investment or companies with low returns in industries where investment is declining. The second guiding idea is that management skill in allocating capital is vital over the long-term. The best managers understand and seek to alter the capital cycle in their industries through sensible reinvestment choices. Decisions about new capital projects, acquisitions or disposals, and equity issuance or buybacks are critical to the ultimate outcome for shareholders. Marathon’s investment team write articles for the firm’s Global Investment Review which is sent to clients and their advisers eight times a year. The purpose of the review, or GIR, is to inform Marathon’s clients of the fund managers’ views on the investment environment around the world, often with particular stock examples. As well as identifying favoured areas for investment, the articles often highlight the excesses and peculiarities which regularly occur in stock markets, posing threats to investors. A selection of GIR articles have appeared in two books, namely Capital Account (2004) covering the years 1993-2002 and Capital Returns (2016) for the period 2002-2015. Both books benefited from the editorial skill of Edward Chancellor, the distinguished financial historian, who also provided insightful introductions to the two publications. Their Global Investment Review is must reading in our firm. Capital Account should be studied by every serious investor. 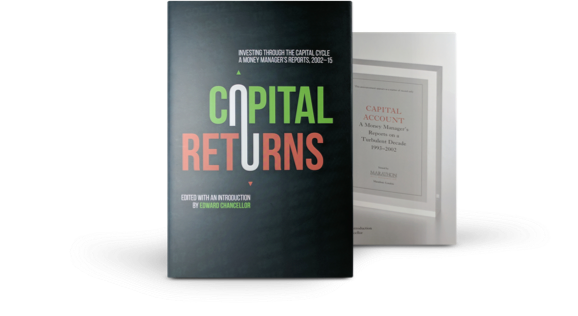 I read Capital Returns in one sitting. I wish this book had been available when I started in the business. One of the best books on investment I’ve ever read.